Some people inherit a genetic mutation (a section of altered DNA, which is the blueprint for the body), which increases their risk of cancer. In other words, this change in the blueprint for the body is passed on by a parent to his/her child and renders the child more susceptible to cancer later in life. Usually these changes only increase the risk slightly. More rarely, people inherit genetic mutations which increase the risk of cancer considerably; these are known as “high risk” genes. The most well known genes like this are the BRACA 1 and 2 genes, which increase the risk of breast and ovarian cancer. Some of these rare high-risk genes increase the risk of melanoma of the skin. The most common are CDKN2A and CDK4 and there is information on these genetic mutations on this web site. Overall, among individuals with skin melanoma, about 2% of them have a mutation in CDKN2A or CDK4. Because mutations in these genes can be passed on through families and increase risk of melanoma, then families with several family members who have each had melanoma are more likely to carry one of these high risk rare genes. In recent years, mutations in other genes have been found to significantly increase melanoma risk. These genes include POT1 and TERT. There is also information about POT1 on the website. This information is about a fifth gene called BAP1. BAP1 was first discovered as a gene which is commonly mutated in melanoma of the eye, (known as uveal melanoma). At first in 2010, the damaged DNA was found just in the tumours themselves but in 2013 in one person the mutation was found in the eye tumour and the blood so that it was recognized that this was an inherited mutation. Since then considerable progress has been made in understanding what inheriting a mutation in the BAP1 gene means for people, and this article describes what is known so far. However, as this melanoma gene has so recently been discovered to be a cause of melanoma in families, much remains unknown. It is important to realize that inherited BAP1, POT1 or TERT mutations are very rare indeed even in melanoma patients. Although we now know that inherited mutations in the BAP1 gene causes skin melanoma in families just as do the more common melanoma genes such as CDKN2A, there are some important differences. People who are born with a BAP1 mutation develop unique-looking moles. Although these moles usually look harmless to the eye, under the microscope, these lesions can look like melanoma to the pathologist. Pathologists may use the term “spitzoid” to describe the appearance down the microscope. These “moles” are sometimes called “Bapomas” by medical teams looking after patients as they do seem to be quite distinct from more usual types of mole. They are typically 3-5 millimetres in size and look like shiny, small dusky red or orange bumps. In a way, they look like small mosquito bites, just deeper red in color. There is a difference though, mosquito bites disappear after a week or two, these spots persist forever. There is a picture below of one of these lesions. 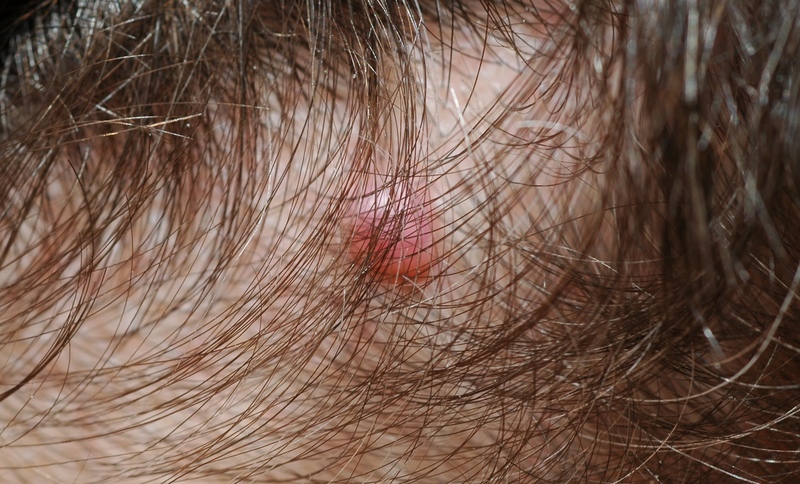 The BAP1 spots can occur in the scalp and throughout the skin. It is not uncommon to have multiple spots develop (“crops” of spots). Although people with an inherited BAP1 mutation often have the pink Bapomas described above they can also get melanoma. Melanomas in BAP1 families may be unusual for melanomas, being more common on the scalp than usual. Although the melanomas have some characteristics seen in all melanomas, such as irregular colours and persistent growth they often arise deeper in the skin than usual and may not therefore have the classical features. It is also important to recognize that individuals who have a BAP1 mutation can also have other irregular looking moles besides the shiny red bumps. The diagnosis is usually suspected on the basis of the family history. The medical staff would ask the family about who had developed a cancer, at what age and what type of cancer. The family tree below is not real but shows the type of family history which might be suspicious for an inherited BAP1 mutation. If a mutation was suspected then the family should be offered genetic counseling where an expert would review the family tree and if a BAP1 mutation was thought possible then a family member who has had a melanoma, particularly eye melanoma, might be offered gene testing. The availability and mode of testing varies between countries. Normally gene testing is only carried out on a family member who has themselves had cancer, as a mutated gene is more likely to be found in such a person. The gene testing may take some considerable time to produce an answer because the tests are specialized and time may be required for additional tests to be sure that the change in the gene detected was a significant (harmful) one. At the moment it is not clear what screening should be offered to family members with BAP1 mutations. With time, research will allow advice to be given on the basis of detailed data collection from families. In the meantime clinical geneticists are likely to advise screening based upon what is known about BAP1 families and the person’s own particular family history. Having too many x-rays may also increase the risk of cancer so the medical teams seek to avoid too many scans whilst trying to scan frequently enough to detect cancer early. Regular ultrasound examinations of the kidney would normally be suggested, an x-ray, low-dose spiral CT or MRI might be suggested for the chest (variable between health care systems), and less frequently body scans for those individuals who carry a BAP1 mutation. Engage in regular sun protection- this is a known risk factor for skin melanoma and is a good practice for prevention of all skin cancers in general. Avoid vitamin D insufficiency if sun avoidant or if you live in a temperate climate such as the UK.